Simple Mills, a leading manufacturer of natural baking mixes, has recently announced its new line of almond flour crackers! Each variety – including Fine Ground Sea Salt, Rosemary & Sea Salt, Sundried Tomato & Basil, and Farmhouse Cheddar – is Non-GMO Project Verified, certified gluten-free, paleo-friendly, and made with clean, whole food ingredients with no grain, soy or artificial flavors or fillers. The base flour of the line is a proprietary blend of almonds, sunflower seeds and flax seeds. This combination yields a higher vitamin and mineral content than many competitive products as well as a lower carbohydrate count and glycemic impact. Most other crackers include ingredients like rice flour, potato starch, xanthan gum, soy lecithin, ammonium bicarbonate and maltodextrin with little or no nutritional value. 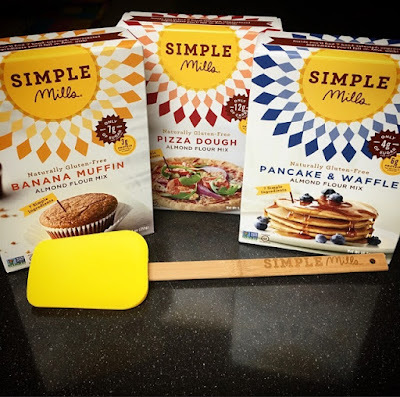 In addition to the new line of crackers, Simple Mills’ offers Artisan Bread, Pizza Dough, Vanilla Cake, Chocolate Chip Cookies, Pancake/Waffle, and Banana, Pumpkin and Chocolate Muffin baking mixes! All Simple Mills recipes are developed by founder and CEO Katlin Smith, who has earned multiple awards for her business model and strict focus on simple, whole foods products. Gluten-free products have been gaining popularity and popping up all over the place. I was very excited to receive some Simple Mills mixes to serve to my family. I chose to start with the banana muffin mix because a muffin is a great snack any time of the day. 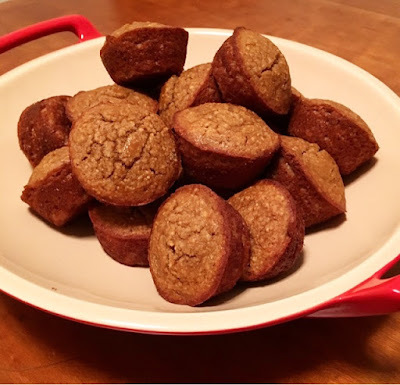 I made mini muffins so the kids can eat them easily and on the go. The muffin texture to me was great and I love how the mixes are preservative free so once you make the mix, the item needs to be refrigerated. You can also freeze some for later. My son really liked the taste, but my daughter did not. In all fairness, she really doesn't like any muffin without chocolate chips so I think it wasn't sweet enough for her. I topped my second one with a bit of honey and liked it. I'm looking forward to trying out the pizza dough mix which is enough to make 2 pizzas and the pancake and waffle mix which has instructions on how to just make just a couple at a time. Thank you Simple Mills for the wholesome mixes and being committed to help people live healthier lives! Simple Mills mini muffins are a perfect snack for anytime of the day!